“When the weather is bad and no other work can be done, clear out manure for the compost heap,” recommends Roman statesman Marcus Porcious Cato, better known as Cato the Elder. In his writings De Agricultura, he shares the secrets to running a successful farm-business in the ancient Roman Empire. In this work, Cato, who lived between 234 and 149 B.C., provides us with an early how-to guide for enriching the soil through the practice of composting. Compost is not actually soil itself, but the dark, crumbly result of a controlled process of breaking down animal and vegetable matter. The resulting product is fairly stable, no longer decomposing at the previously speedy rate, and is full of nutrients (especially nitrogen and carbon) and minerals in forms ready for hungry plants to absorb. Black gold: The earthy results of composting with worms. Credit: Red58bill, Creative Commons Attribution 3.0 Unported license. But composting isn’t just any old rot, full of stink and muck. It involves humans maintaining roughly the right ratio of moisture, air, carbon, and nitrogen. It involves aerobic decomposition, which requires oxygen and is the main reason for occasionally “turning” or mixing a compost pile. It also involves microbes, fungi, insects, and worms all munching on and pooping out the delicious organic (carbon-based) goodness in a compost pile. A dedicated “compost pile” isn’t even necessary for this magic to happen. 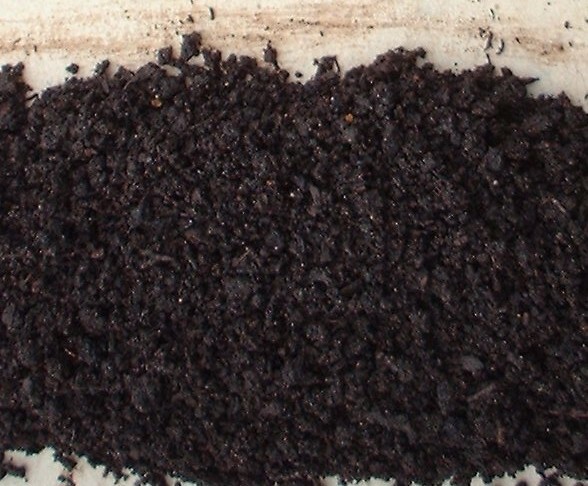 One of the many ways to compost is referred to as “sheet composting.” At the end of the growing season, you mix up a moist layer cake of nitrogen-heavy “green” materials (e.g., mowed grass, bolted lettuce plants, chicken manure) with carbon-heavy “brown” materials (e.g., chopped up woody plants, dead leaves, cardboard). You toss all of this right on top of a garden bed, cover it with some burlap sacks, and ignore it until spring, when you will find several inches of nutritious compost on top of the plot. This method doesn’t sound all that different from some of the oldest practices of humans composting. Sometime in the Neolithic Age, roughly 7,000 years ago, when hunter-gatherers began making the switch to farming, they figured out that having manure and vegetable waste in the soil around their food plants was a great idea. In addition to the Romans and Neolithic Scots, the ancient Chinese and Egyptians also had an appreciation for amending the soil. Cato the Elder, however, preferred burying manure and other compostable materials around the roots of olive trees and grape vines and letting it break down there. His techniques apparently went beyond these modern sustainable farming practices and strayed into what we might now call the “biodynamic” (“a spiritual-ethical-ecological approach” to farming that emphasizes the land as an interconnected, living organism and takes into account things like planting and fertilizing based on lunar cycles and burying in the soil at night a cow horn stuffed with cow dung). Farmers, take note: a new moon is the best time to compost. Pigeon, goat, sheep, cattle … all are good sources of manure for Ye Olde Compost Pile. But a question that often comes up for Ye Modern Urban Composter and Pet Owner is whether or not you should add dog or cat poop to your compost. In long, because dog and cat feces are full of pathogens, or disease-causing microbes and parasites which humans should want nothing to do with. Many of these pathogens or their eggs or spores won’t be killed by the composting process and can stick around in the soil for a long time, in some cases, up to four years. Dog poop in particular has been studied as a plentiful source of nasty microbes, being called a “reservoir,” even, for Escherichia coli (E. coli). Rural communities in Canada have been observed to have a high incidence of pathogens in dog feces, including Toxocara canis (roundworms), Echniococcus granulosus, Giardia duodenalis, Cryptosporidium spp., and Campylobacter spp. And let’s not forget Salmonella. What do these pathogens do to people? All kinds of fun! These are not the sorts of things you want to be putting on your tomatoes and lettuce. Of course, livestock manure can have some pathogens too, such as E. coli and Salmonella. To kill these pathogens, the manure needs to be in a “hot” compost pile, where they are exposed to temperatures maintained at 140 degrees Fahrenheit for at least three days. It’s generally accepted that composting dog and cat feces would run a much greater risk to humans. So, don’t do it. Instead, “doo” as the Romans do. At this point in my life, I love it and I think that everyone should learn the basic culinary skills (chop, boil, saute, etc.) to feed themselves and their families healthy food. But I used to stumble through my meals, relying heavily and with blind faith on complicated, by-the-book recipes, balanced out by the most basic of quesadillas. It’s not that my parents never introduced me to cooking growing up. They expected my three siblings and me to be able to make pork chops and cheese potatoes, hamburgers, mashed potatoes. The type of hearty Midwestern meals centered on meat and potatoes. But the secrets of seasonings–aromatic fresh herbs, exotic powdered spices–remained foreign to me. To the extent that I once “experimented” by adding something like nutmeg to canned spaghetti sauce, to the dismay of my waiting family. My parents informed me that I would be eating the leftovers. After graduating from college, I moved to Seattle, a city I had never been to and have not since left. A city with a vibrant local food scene. Here, I lived with someone whose culinary prowess exceeded my own, who savored trips to local spice shops, who was willing to toss an occasional wild card into the proverbial stew pot. Who could feed five hungry roommates on a $10 dinner budget and who let me in on the joyful secrets of cooking. I stopped eating meat. 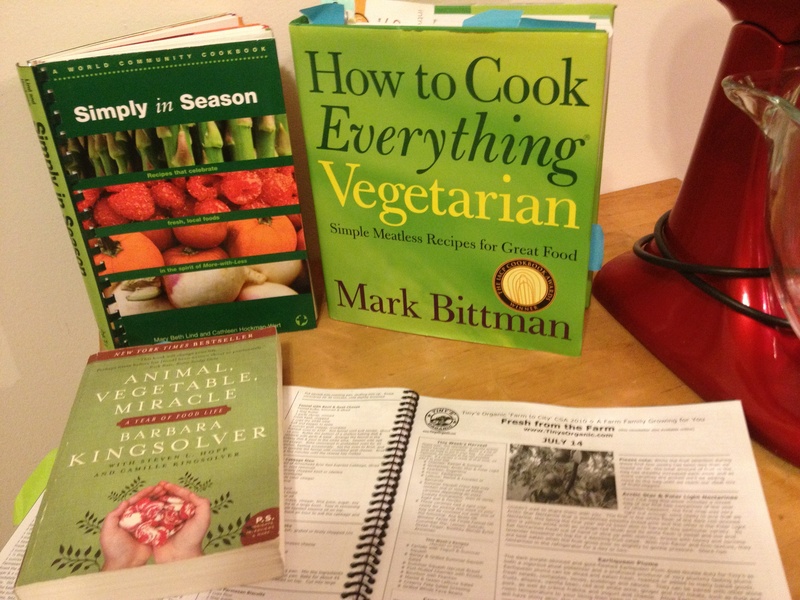 Inspired by the talented writings of my then-colleague Tom Philpott and uninspired by the destructive policies of industrial agriculture and factory farming, I gave up meat for Lent. And the habit stuck. This sent me back to the drawing board to learn how to cook a meal without meat as the anchor. I got creative. I eventually subscribed to a community supported agriculture program, Tiny’s Organic. This third-generation family farm a couple hours away in central Washington inundated my fridge and shelves with pounds of fresh, flavorful fruits and vegetables every week for six months of the year. Here were delicious, diverse varieties of produce I had never tasted or even heard of, which piled up–and often rotted–quickly. This was an incentive to figure out what to do with feathery, pale green bulbs of fennel, a dozen velvety orange apriums, or an unidentified, warty winter squash. It was a combination of these factors that led me to begin chopping, mixing, roasting, sauteing, and baking with new vigor. Now I was preparing food with a joy and flavor I hadn’t previously known or embraced. 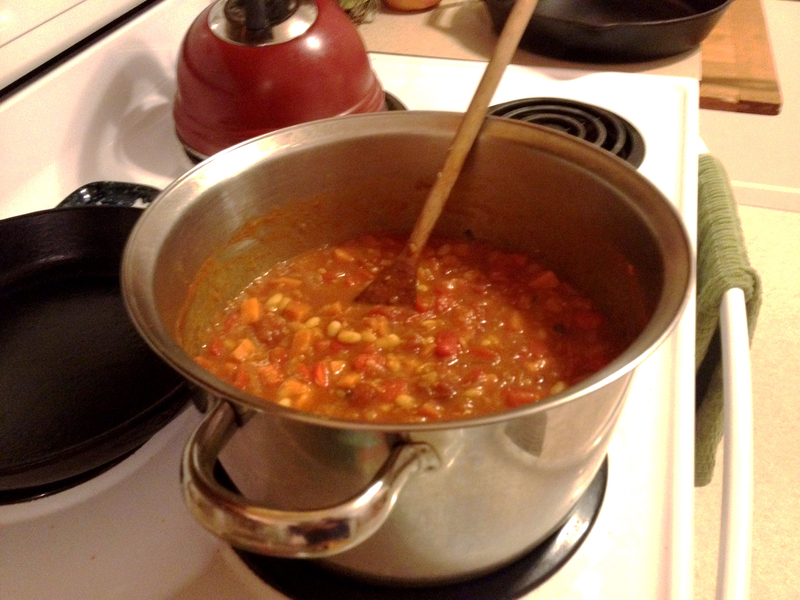 Sweet potato and white bean chili. Vegetarian tested, carnivore approved. Credit: Ashley Braun/All rights reserved. But I’m not going to pretend that this transformation was instantaneous (it wasn’t) or that it was always satisfying or successful (nope, neither of those). I’ve boiled over soups and jams, scorched sauces, sliced fingers (five stitches), and been dead on my feet, exhausted after a long day of work and several hours of cooking, with an expectant and miserably large pile of dishes to tend to after my tasty but too-few minutes of mealtime. This was more like plum soup served in a buttery crust bowl than plum pie. Credit: Ashley Braun/All rights reserved. I made this savory piece of heaven with ingredients already sitting around in my fridge: leftover pie crust, dandelion pest, caramelized onions, kale, tomatoes, parmesan. Inspired by Bonnie Azab Powell. Eaten by me. Credit: Ashley Braun/All rights reserved. Still, I think it’s worth it. Everyone’s going to take a different path to feeding themselves, but I’m happy that mine has led to improvised sweet potato-white bean chili, juicy plum pie, and flaky rustic tart with kale, dandelion pesto, caramelized onions, and fresh tomatoes. Everyone’s invited to the feast; let’s eat! …we don’t spend enough time discussing what happens to food once it’s in the home. Or what doesn’t happen. Which is cooking. And that part is pretty simple. Not long ago, cooking was a common topic. Weekly food sections of newspapers were filled with it. Churches self-published cookbooks by the pile. There were even real cooking shows and cookbooks. Now, if it weren’t for the vibrant but dwindling community of bloggers, we’d hardly see actual cooking discussed at all. There are but a fraction of the food pages there once were in newspapers, and most cookbooks are offshoots of TV “cooking” shows, almost all of which are game shows, reality television shows or shows about celebrities. Like many professional urbanites with grown children, I often succumb to the temptation to work late and eat out with friends. I agree, with the following edit: Like many professional urbanites with who act like grown children, I often succumb to the temptation to work late and eat out with friends. 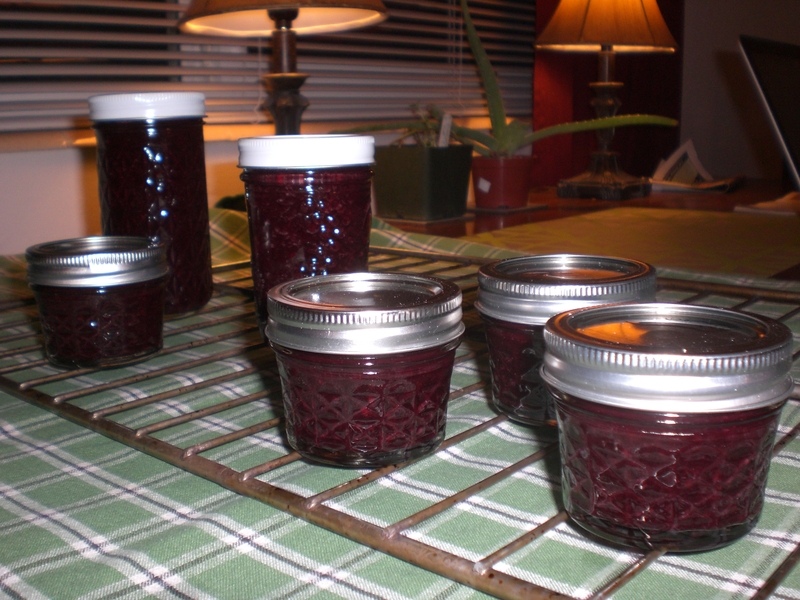 My first, hopefully botulism-free, cans of cherry jam. Time of photo: Approximately 11:30pm. Lightly toast the quinoa in a saucepan over medium heat until it smells nutty, fragrant, and something like popcorn. Then add a tablespoon or so of olive oil and 2 cups of water. Cover with a lid, bring to a boil, and then turn down the heat so the quinoa simmers and absorbs the water (about 20-25 minutes). Meanwhile, sauté the onion in olive oil until translucent and add the chopped squash to cook down. Next, add the can of tomatoes, chili powder, cumin, and oregano, and bring to a simmer. Once the squash is starting to cook through, add the sweet corn and black beans and simmer again until everything is cooked through and smells delicious. Season to taste with salt and pepper. I think adding a little cinnamon might be good too. Serve the stewed vegetables over quinoa and top with fresh avocado and extra sharp cheddar. Look at me; I made (and ate) that up! I’ve hinted at this heavily in other blog posts, but it bears exploring: For the duration of this trip (four weeks), I’ve returned to my Midwestern meat-and-potato roots. Being a vegetarian in Bolivia, one of the original meat-and-potato regions, seemed like a not-very-fun, not-very-feasible, and not-very-nutritious idea. Having been here for a week, I can see that the host families I’m staying with would need ample notice of my dietary preference, and I would miss out on trying charque de llama (kind of like llama jerky), cordero (lamb), and sheep’s feet (the tiny bit I tasted didn’t go over well with my taste buds). I became a vegetarian for environmental reasons in the first place. Not because I hate eating meat, but because of the hugely wasteful, polluting, and unsafe industrial meat production in the United States. I didn’t want to add to extra hormones in cattle, extra greenhouse gases in the atmosphere, extra manure/pesticides/synthetic fertilizers in watersheds, or extra cholesterol in my heart. A healthier me and a healthier planet are two side-effects I’ll accept if it means giving up a burger. I don’t have a problem with eating sustainably raised meat now and again (which means outside of Concentrated Animal Feeding Operations, or CAFOs), which brings us back to Bolivia. CAFOs haven’t exactly hit Bolivia yet (and I hope they never do), so I don’t have reservations about a brief return to my previously carnivorous ways. Because I’m at the mercy of other people for every meal on this trip, my vegetarian diet in this country would mainly consist of bread, rice, and a variety of potatoes. (Oh and some cheese.) Now, Bolivia is chock-full of quinoa, a delightful grain and a complete protein, but I haven’t even had the chance to sample it here yet. The veggies I’ve encountered thus far, when cooked, have mainly been of the frozen variety and served chilled. I eat them all, but they get a nose wrinkle from me. However, I’m going to take this opportunity to love on salteñas, small pockets of a special dough filled with yummy meats and veggies and juices and spices. Not unlike empanadas, though they have those here as well. Other tasty foods: maraqueta, the traditional Bolivian bread often (for me, always) served at breakfast and at plenty of other meals or tea as well; the pacay (cotton candy fruit); and fresh regional cheeses. The beer here is mostly pilsners, which make me long for the microbrews of the Pacific Northwest. But the mate de coca, an herbal tea derived from the unrefined leaves of the coca plant, has been a nice way to warm up (and ward off altitude sickness) on the Altiplano. Don’t worry, mate de coca isn’t the gateway drug to snorting crack off of a llama’s nose. I haven’t found that one yet. What I have found, however, is singani, the national drink of Bolivia, which is a strong liquor derived from maize. The Rotarians in Oruro took our group out to Karaoke last night and poured us several glasses of singani and Sprite. Pretty good, in my opinion. My Karaoke skills? Not so good, in my (and probably others’) opinion. I did manage to belt out some Notre Dame/Backer favorites, such as “Africa” (Toto), “The Final Countdown” (Europe), and “Livin’ on a Prayer” (Bon Jovi). It turns out that when you have to sing Karaoke by yourself, it’s much trickier than doing it with a group in a bar that’s too loud to hear the words anyway. But still fun … after all, how often do I get to sing 80s songs in English at a Bolivian bar? Not as often as Coke or Pepsi are served at meals here, which is quite a lot. I’ve been sticking to fruit juices, tea, beer, and bottled or boiled water. Water is a big deal down here, both access to any water and access to water that is safe to drink. Which is why it is such a big deal that, for example, Illimani, the triple-peaked, be-glaciered mountain overlooking La Paz, recently lost two of its glaciers. The water that used to be stored there like a reservoir would now be like money in a bank that failed. Ouch.